Guide your army to victory as a warrior queen from the Middle Ages, or adventure through a fantasy realm as a fearless mercenary. 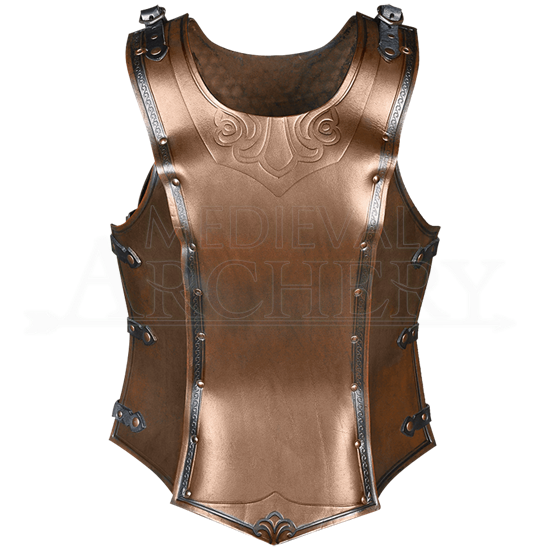 No matter the role, the Artemis Embossed Leather Cuirass for Ladies raises both style and defense. This chest armour features an antique patina finish and embossed floral embroidery. Fleur-de-lis patterns decorate the center of the bodice, while embellished trim in a contrasting color details its edges. Rounded edges offer improved comfort, while riveted segments and offset edging aid in deflection. Customize the fit at each side with two adjustable buckle straps. The straps at the shoulder make it easy to add attachments such as the Artemis Leather Pauldrons.